A selection of press reviews and comments from members of the public. I enjoyed your San Diego concert immensely. I drove 2 hours to hear the Spreckels Organ for the first time and don't think I could have possibly have picked a better night to attend. I would turn right around and drive back to hear the same program all over again. I will keep watching for a return visit in the future. Thank you so much for a wonderful evening. Dear Mr. Hearnshaw, It was a true honor and delight for my brother and I to be among your sponsors last night. You were spectacular. Everyone thoroughly enjoyed your humor, appreciation of the organ, and brilliant playing. Thank you for an excellent recital today, the colours and tones throughout were spectacular and showed the organ, music, Priory and yourself in best light. I've never heard such a conversation between desks in the Bach Toccata & Fugue before; it was quite extraordinary and worked wonderfully well. Keith, Just got home, grinning from ear to ear. Thank you for an incredible lunchtime recital at the Priory. Superb programme and brilliantly imaginative registrations - truly colourful and interesting. Thank you so much for coming to Beckminster and treating us to your amazing talent and allowing us to experience the newly restored Bishop organ. It was a wonderful evening and everyone who attended was inspired by the music. You have a rare gift - to be able to play at an extraordinary level and yet to communicate warmth and humour to the gathered assembly. Just a quick word to say a final BIG THANK YOU for all your hard work and patience in bringing the Battle together. Everybody seemed to really enjoy the whole experience, and I thought the programme was spot on. A damn good tune, as I like to say, and what the general populace wants at these events. The way you and Alex Binns pulled it all together in the very limited time was incredible. Many thanks for playing the recital two weeks ago. I have heard many good things and hope that you will come again next year. I attended your recital at Bridlington Priory recently with a friend, and we both enjoyed it very much. Your enthusiasm both for the organ and the music was very well communicated, and I'd be surprised if any of the audience went home disappointed. Many thanks for your excellent recital. Many people have made a point of contacting me to say how much they enjoyed your programme and playing. I hope that you will consider returning in the not too distant future. Thanks so much for playing. I particularly enjoyed the wonderful colours you found for BWV 565 - very exciting. Well played Keith! Would have been happy to listen for much longer than 30 mins....I had my eyes closed and was almost back at home in Liverpool listening to Westminster's big brother! Thank you SO much for the splendid recital today. It was really super. The audience really appreciated the way you talked about the music and were thoroughly absorbed by your performance. Thank you for a superb concert. We have had many positive comments. We thoroughly enjoyed the concert; the applause showed how much your playing and presentation was appreciated. Thank you once again for coming to St. Ann's and have a good summer. You used the organ so well and got so many tone colours from it. Your whole presentation on Saturday was absolutely lovely; the choice of music, introductions, camera and screen, and of course the playing, all contributed to an ideal concert for me and the whole audience. "Stunning! Ecstatic! Can't he play? Never heard anything like it! That's what St Luke's was built for! Sent shivers down my spine! When's he coming again?" Just a few of the comments after your concert. What an exciting start to the St Luke's recital series! Thank you for playing at Blenheim Yesterday. The Library had a lovely atmosphere. Thank you for your help and support. People have been saying how thrilled they were with your recital. Most are totally unaware of what actually goes on at the organ console and to have it on a screen was a real educational experience for many. Your inimitable style makes the music so accessible. Thanks for a wonderful concert. As always, you put together a diverse and interesting programme which was executed with skill and panache. We thought your rendition of the Boellmann Toccata was grave, dramatic and the best we've heard. I really enjoyed your recital. It is so refreshing to have a mixture of classical and light music. I was impressed by your programme. A lot of famous organists could learn from how you put a programme together. I thought your recital at Lincoln Cathedral was professional perfection. Your programme, registrations, command and control at times were quite thrilling. Top stuff! You were clearly enjoying your reunion with the Willis and got some wonderful orchestral colours out of it: the organ sounded at its best. In particular I enjoyed the Evening Song and loved the way you handled the melody with such warmth and flexibility. Thank you, thank you, thank you for a splendid gig! Everyone enjoyed it very much. We must get you back here next year. 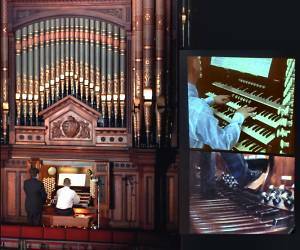 Having the large screen certainly adds a whole new dimension to organ recitals generally, but your varied programme and its brilliant execution were second to none. You've taken on the Tracey (and Carlo) touch - having the audience eating out of your hand before you play a note - then playing brilliantly! It was great to meet you too, and fantastic to experience your playing. You certainly produced the most enthusiastic audience reaction I've witnessed for a lunchtime recital! A young organist in a hurry - that's Keith Hearnshaw of Droitwich, who put the Victoria Hall's magnificent organ through its paces with a vengeance on Saturday. Keith opened with a Prelude on Greensleeves by the U.S. organist, Richard Purvis. Perhaps it's as well that Henry the Eighth - traditionally the composer of Greensleeves - never heard anything so contrived; the composer would have needed to fear for his head! Things livened up with Bach's Prelude & Fugue in A minor (BWV 543). Keith invested this massive amalgam of music and mathematics with enormous power and drive, and it was impossible not to forgive him the occasional false registration. Cavatina, the Stanley Myers composition featured in the film The Deer Hunter, had an alluring grace, and In a Monastery Garden by the Aston composer Albert Ketelby must have awakened many memories. Fantasia in F minor (K608) by Mozart tested Hearnshaw to the full and he passed with flying colours. This mighty flow of harmony was written in the last years of Mozart's life, and revealed where Beethoven discovered some of his ideas. My Heart Will Go On, the 'Titanic' theme, was suitably sentimental, Boellmann's Suite Gothique treated the audience to yet more exciting turbulence, and Gordon Balch-Nevin's Will o' the Wisp gave Keith the chance to demonstrate further his skill on the organ's flutes. The Finale from Organ Symphony No.3 by Saint-Saens in David Briggs's arrangement, can always be guaranteed to bring the house down. With Keith Hearnshaw at the console, it did. A 'Sonic' performance, with Mozart's Fantasia in F minor and Offenbach's Overture with an encore by E. Coates just past the anniversary of the Dambusters. The colour stops and registrations you chose certainly made the Binns 1913 organ sound luscious in J.Horner's 'Titanic' theme. Your presentation was so inspiring and interesting ... Thankyou. Oldham, Rochdale and Thameside Organists Association once again succeeded in bringing a talented soloist to the Town Hall Organ. Keith Hearnshaw is one of a new generation to pursue a career as an organ virtuoso; after training at Birmingham Conservatoire and winning several organ scholarships he became a Fellow of the Royal College of Organists in 1997. He gave us a neatly balanced programme with quieter numbers between the blockbusters. Massenet's Meditation from Thais gave way to the other J.S.Bach Toccata and Fugue in D minor, not the famous one, but it rattled the walls and floor. A peaceful Aria by Callahan gave us a breather before Walton's magnificent Crown Imperial. Goss-Custard's Serenade was serene but some pedal notes shook the hall because of their sheer depth. This led to Widor's monumental Symphonie No. 6 which was superb, including a cheeky wave behind his back to say "look no hands" in a fiendish pedal section. A bright and breezy encore brought a delightfully exuberant recital to a close. There were some unusual moments of interpretation and controversial tempos but the enthusiasm was contagious with one of the best ORTOA audiences for some time. As with so many visiting players, he saluted our own renowned instrument and clearly revelled in its colours and combinations. It was wonderful to hear it put through its paces in this way.